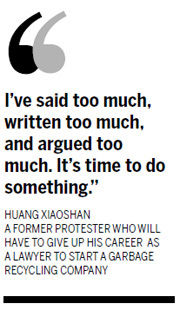 BEIJING - No one, including Huang Xiaoshan himself, could have pictured him as an environmental activist one year ago. The successful lawyer lived in a villa in the Xiaotangshan resort area in northern Beijing, took road trips in his luxury SUV, and played golf three times a week. That all started to change in August 2009. "I was playing golf in Thailand when my neighbor called, saying the government had announced a plan to build a garbage incineration plant near our houses without soliciting public input," he said. Many, including Huang, worried the incinerator would pollute the environment around the plant, filling the air with hazardous dioxins. Huang rushed back to join the protest with dozens of his neighbors, and was detained for five days for "disturbing public order". "It was almost a natural reflex for me and other residents in the neighborhood to protest," Huang said. "We didn't embrace environmental issues at first, but we did know what would happen to the price of our properties and our families' health if a garbage plant was built near our homes." To stop the plan, Huang and his neighbors began learning about garbage incineration and came up with a 44-page proposal for the government. The proposal, in return, earned Huang, then a leader among those against garbage incineration, a chance to join the Beijing government's visits to Japan and Macao in search of solutions for garbage disposal. Impressed by the clean and pollution-free incineration plants in Japan and Macao, Huang has changed his view of incineration, agreeing that it is a good method -- if appropriate garbage sorting has been done. 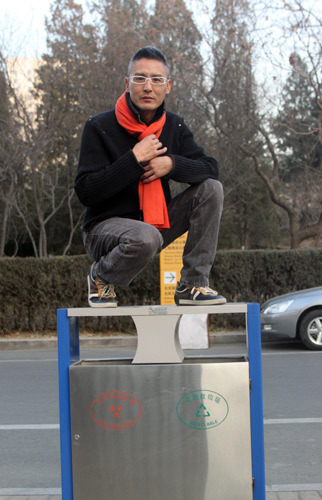 When he was named one of the "2010 Top 10 Low-carbon People in China" by the Guangzhou-based Southern Metropolis Daily in late October, Huang revealed his plan to build a garbage recycling company. "I've said too much, written too much, and argued too much. It's time to do something," he said, adding that the idea of building up the company started in early July. Beijing generates around 18,000 tons of garbage a day while the city is only able to process 11,000 tons per day. Huang believes kitchen waste is the most challenging part of garbage treatment. "Most household garbage is kitchen waste," Huang said, "and two-thirds of kitchen waste in China is liquid, which is not suitable to be burned or transported a long distance." His company, whose name was just approved by the Changping district government, will focus on processing kitchen waste in residential communities in Beijing. He emphasized his goal is to transform the waste directly into fertilizer in residential communities, avoiding the pollution caused by transportation, and even making a profit by selling the fertilizer. He said he is not doing this for money (he says he's already rich enough), but "no environmental protection project can last if it can't break even or make a small profit". "Projects relying on government subsidies or people's awareness aren't sustainable," he added. His ambitious project has already attracted attention from three famous international venture capital companies, according to Huang. But while preparing for the opening of his garbage recycling company, Huang hasn't found a chance to grab a golf club or take a road trip in his Lincoln Navigator. However, that's not the only thing he's had to sacrifice. "I have to give up my lawyer's license once the company opens," Huang said, as lawyers are not allowed to do business in China. It was a tough choice for him but one he said was the right thing to do. There was a time when Huang had a cell phone especially for answering calls from journalists and doing interviews. Now, instead of being interviewed in his favorite cafe near a subway station like he has done over the past year, Huang is using the place as a temporary office for meeting potential business partners. Huang still talks fast and smokes a lot, wearing a bold yellow down jacket, reminding one of the confidence usually seen in a lawyer. "I'm not sure what kind of difficulties lie ahead because no one has ever done this before," Huang said. "But I'm so sure I'm on the right track that I'll regret if I don't do it."